I've not had too many run-ins with snakes in the many years I've been living here. Never seen a really huge one except at Phuket Zoo.. oh and I have seen banded sea snakes many times while diving in the Similan Islands - they are really poisonous but totally ignore divers. Snakes are a fact of life here. Our house is close to a big tree-covered hill, not in the middle of town, so we do expect a snake now and then. A couple of years ago, we'd get one every week, but normally just small things. A couple of baby cobras... which makes you think "where's mama?". We have had hardly any in the last few years - we have 2 cats which I think is enough to deter snakes. My wife called me at work a few weeks ago saying she'd seen a big one in the garden but it had slithered away, then she saw it hanging on a tree next to our house. We do worry about snakes since we have 2 kids. She was worried this one would come back - and it did! I saw it hanging on the gate a couple of days later - about 3 feet long, green colour, and aggressive. It really did not like being hit with a spade. Liked it even less on the second hit. Well, I'm not a killer, but I'm not a vegetarian either and don't want a poisonous snake near my kids! 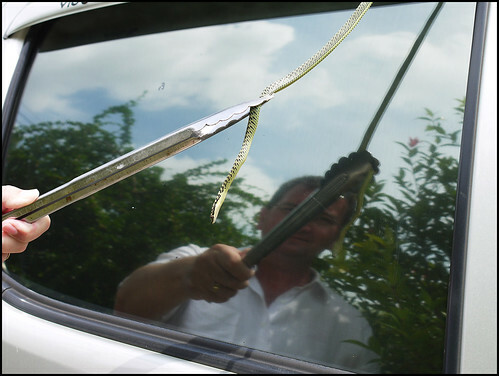 (above) Golden Tree Snake in our garden and another photo of me gently removing one from our truck! These tree snakes/whipsnakes are not really dangerous. They do have venom and I guess you don't want to be bitten, but they're not going to cause an adult human any problems. 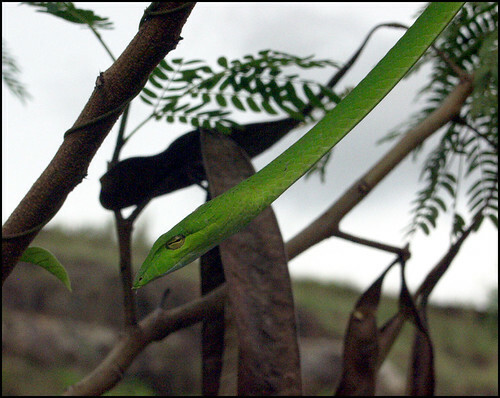 The tree snakes can move really fast, blink and they can vanish into trees or bushes. 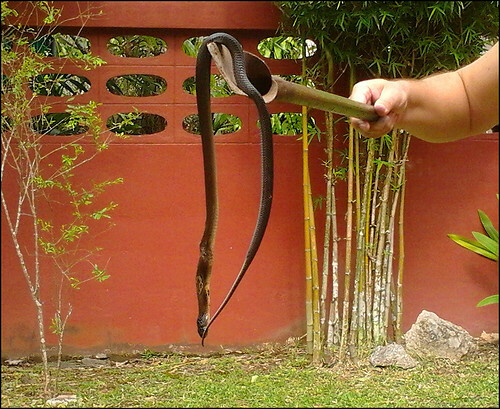 I was once doing some gardening and a tree snake "flew" out of a tree right onto me! Momentary panic until I saw what it was. (above) a no-longer-alive Monocled Cobra. We have had a few of these in our garden. The biggest over a meter long. Any bigger and I'd be calling the snake catchers for sure. Nasty snake. Very venomous. I make no apology for killing this one. 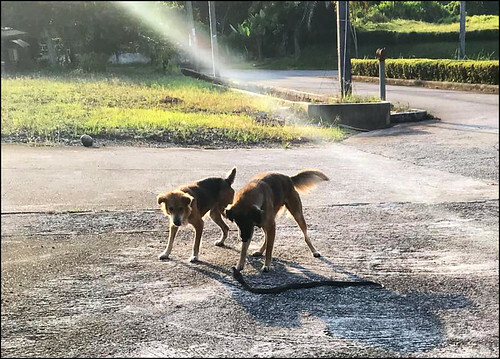 (above) On our street .. 2 dogs fighting a monocled cobra! And sometimes (as photo below) it's better to call the snake catchers! 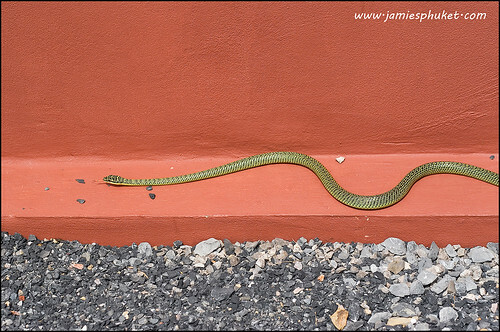 This one was about 3 meters long, my wife was home and thought it was a cobra. Turned out to be a really big rate snake (non venomous but can still give a nasty bite). If I saw a snake this big I'd do the same as my wife - not trying to tackle that on my own! I found a great website several years ago about snakes in Thailand - www.thailandsnakes.com - anything you want to know about snakes in Thailand is here - lots of pictures, some videos, explanations of which snakes are venomous / dangerous. 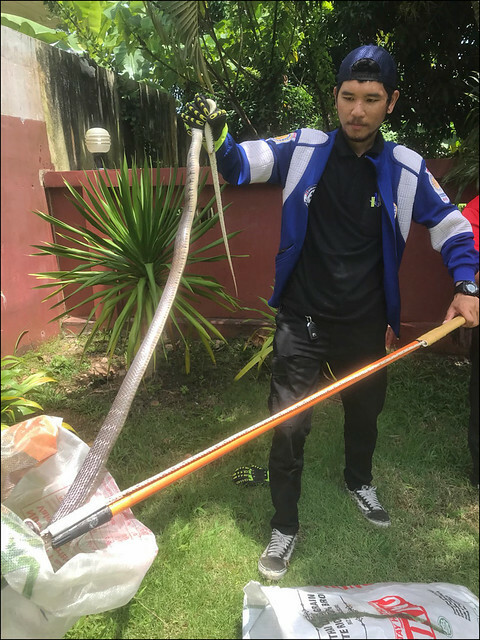 Here in Phuket if you did see a really big one, call the police and they call the local snake catcher. Normally big ones are released back into the wild. I admit that I prefer to whack with a spade first, ask questions later. I have been reading the snakes in Thailand website quite a lot in order to recognise some of the real nasty ones like the Malayan Pit Viper. Never seen one, don't want to! Buy a House in Phuket! Can you spot the Ladyboy? What to do in Phuket when it's raining? Welcom to Thailand. We Spik Inglish. Jamie has been living in Phuket since 1999, married with 2 kids and very happy. He has been traveling all over the world, but it was Thailand that finally persuaded him to stop drifting.